We all love looking at cute mice when we see them playing with other animals or eating small pancakes with their tiny hands. They are not so cute, though, when they are not domesticated and infesting your home. There are different types of mice like the plain field mouse, the deer mouse or the harvest mouse. Only the house mouse, however, will try and enter your home, as this is the most adaptable kind from all the others. These animals are omnivorous, so everything in your kitchen is a treat for them. Why would a mouse come to my house? We don't like the cold, so in winter time, we keep our homes nice and warm and we peacefully enjoy the winter. Well, mice don't have the abilities to build a strong house like ours and an internal heating system. In two words - they will come when it's cold as our houses radiate heat and life. A small entry point will be enough for the mouse to get inside and with its highly developed odour senses, it will quickly locate where all your food is and feast like there is no tomorrow. Mice have many reasons to nest. The most common ones are to breed and protect the litter, to keep themselves warm, to store their food and to safeguard their young ones against predators. 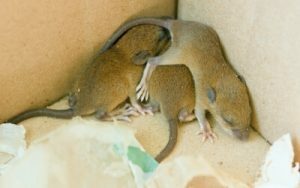 Once the mice have settled in a house, the male and female are highly motivated to build a proper nest because, just like all the other animals, they are doing their best to survive. What are Mice Nests Made of? Stuffings from mattresses and pillows. If you notice torn newspapers or gnawed fibreglass, then most likely a mouse is trying to build a nest right under your nose. A mouse nest does not look neat like a bird's one. Mice just take different ingredients that they've chosen and bundle them into a ball in no particular order. A mouse nest is messy but comfortable like a teenage boy's room. Another important thing to remember when searching for a nest is to look out for droppings. Their size can tell you whether you have a mice infestation or a rat problem. Mice droppings are relatively smaller than the rat faeces. They are black in colour and around 3 to 6 mm long. This is one of the most important clues you have to keep an eye for, as just the existence of a nest does not necessarily mean there are live mice around. So, watch out for other clues as well before jumping to conclusions. Where to Find a Mouse Nest? You don't have to go all the way to Paris to find a nest (even though Ratatouille was a rat, not a mouse, many people still get confused). The sneaky rodents tend to build their messy homes in places that are warm, close to food and well hidden. Right behind kitchen appliances - the oven, the fridge, washing machine and so on. Behind a heater. The warmer - the better. Inside the walls, Jerry style. The holes won't be exactly like in the cartoon a.k.a. in the middle of the wall, but still, try to look for any cracks and crevices, or weakened spots around the wall baseboard. As we mentioned, even the smallest entry point is enough. In your kitchen cabinets. The lower ones have a higher chance of becoming a 5-star mice hotel, as they are easier to get out and in from. Mice are timid creatures that rarely go far away from the nest in their search for food. They love settling close to electrical appliances because they are warm. However, that is very dangerous as these rodents often chew the cords and cables to file down their teeth and gather more nesting material. What are the Damages From a Mouse Nest? 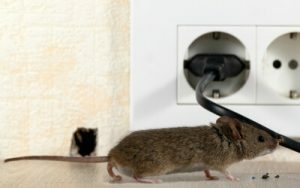 In order for the mice to build their nest, they partake in a series of behaviours, which cause serious damage to our properties and our health as well. The actions that the tiny rodents take are in this order - digging, push-dig, shovelling, carrying, fraying, sorting, pulling and fluffing. In the process of nesting, mice do a lot of damage to our property while trying to gather materials and build the nest itself in their chosen location. Mice can destroy your car’s engine, as it’s their very favourite place for nesting. And these examples are only the pure structural damage mice can cause without mentioning all the diseases they carry. You have to be very careful when you notice the signs of an infestation, while looking for clues. Lyme disease, which is caused by ticks in mice. Mouse control is of the highest demand at the moment for many reasons. The main one being that they are so successful at reproducing, holding the first place in the rodent category and second - in the mammal category. How many mice are in one nest? In one nest, the least number of mice you will find will be around 5. Like lots of other animal groups, there is only one male in a nest. The rest are always female. How often do mice breed? In the mice world, much like in the human world, the younger, stronger female has a better chance of producing a big litter. The number of young ones varies - from 4 to 16 pups per mother and one mouse can produce up to 10 litters a year in the right conditions. When do baby mice leave the nest? Male mice are usually the ones leaving the nest as they feel the need to make a new one. That occurs usually around twenty days after the babies are born. Female mice become reproductively mature at around five to six weeks after being born. After that, they are ready to continue with the cycle by giving birth to new pups. Those are the main reasons why mice are so successful in breeding when compared to other mammals and animals in general. They reproduce almost impossibly quick and are fully capable to become a colony in a limited period of time. In other words, the pesky pests can take over your home before you even notice. How to Prevent the Mice From Making a Nest? The best way to discourage mice from achieving the home invasion of the century is to make your house as unattractive to them as possible. Taking in mind their nesting habits that we mentioned above, make sure that there are no conditions for them to form a nest and live there. Seal all your food in secure packages and always keep your kitchen clean. One mouse needs around 3 gr of food per day, so even the smallest amount is enough. Deny them the cosiness of your garage by keeping it clean and regularly checking it along with your car engine for possible nests. You don't need those old cardboard boxes, so just throw them away. If you need them to store some of your stuff, just choose some sort of a metal or strong plastic container. Something difficult to penetrate. If you have a closet full of old clothes, get rid of them. Any seasonal clothes you can keep somewhere rodent-proof, give them away or make some tapestry. Just don't keep them unsecured, as they are the perfect nesting material for mice. Go around your house and check for possible entries like holes or cracks, especially around electrical outlets, pipes and the inside of your cabinets. What To Do When We Find There is a Mouse Nest? Okay. You found the nest you have been looking for. What to do? Well, first, do not touch it with your bare hands. Put on gloves and a face mask as well! Place it in a bucket very quickly if by any chance there are still mice inside. If there is one and you cannot kill it, take it somewhere far and let it go, like in some woods far from humans. Once the nest is empty, burn it down or throw it as hazardous waste. Make sure to clean all the leftovers and droppings with bleach and kill all the bacteria. Want a professional help with your mouse problem? As a commercial service provider we only aim to inform you about mice nests according to the professional experience of the pest technicians. However, we cannot guarantee that the above-mentioned advice on how to prevent mice nesting, will lead to successful results.